There are games that you have to play because they’re beautiful pieces of art that move the soul, and there are games that you have to play because they’re just fun to turn your brain off and enjoy. Onechanbara Z2: Chaos is most definitely the latter. Onechanbara are a unique kind of game: They’re all beat-’em-ups known for their gore and fanservice. In Z2 you take control of four female ‘samurai’ (hence the chanbara name) and slice/bludgeon your way through hordes of the undead. It’s not exactly highfalutin stuff going on here, but it’s fun in much the same way watching a person getting punched in slow-mo is. Not enough games make you feel like a badass from the get-go. Fortunately, Onechanbara does well to take after the games it’s most likely to be compared to, Devil May Cry and Bayonetta. Hacking through enemies is a trivial matter, and once you get a hang for how each of the game’s four characters control, and learn when to tag out (and how to abuse the game’s chase mechanic), you’ll be reveling in your enemies’ agony. The core of Onechanbara’s action gameplay is addictive and entertaining, if a bit repetitive at times. Action is fast and fluid, each of the game’s four characters has multiple combos at their disposal. No two characters feel the same, either, meaning there’s a layer of strategy to who you should choose based on what you’re up against. We’ll talk more about that later though. There are plenty of strategies you can try, but with as powerful as you feel—especially on lower difficulties—you might not need them. You do get penalized for taking any amount of damage though, usually to the tune of thousands of points lost, so if you’re the type that is a perfectionist, you’ll want to master dodging and parrying, which can be difficult when you’re facing over against dozens of enemies in tight places. As is standard for the genre, Onechanbara includes QTE-style attacks on bosses that typically involve one or more of the characters in your party removing limbs or otherwise inflicting incredible suffering upon their assailant, and it’s awesome to watch. Repetition aside, Onechanbara’s fast-paced combat feels great. Stringing together hundreds of hits is a seamless experience, and tagging characters in and out (which is done by pressing either up or down on the d-pad) worked exactly as it should. Even if you’ve never played an Onechanbara game before (I hadn’t), you’ll have no problem picking this up and wreaking havoc. Onechanbara Z2: Chaos starts out a tad on the easy side. The default difficulty is medium, which feels like most games’ easy. Once you clear medium difficulty, however, you can open up Hard, Violent and Berserk. To say that the challenge ramps up would be an understatement. Personally, I doubt I could survive more than a few moments in Violent, but I’m also not the best at these kinds of games. There are plenty of players out there that’ll go nuts trying to score that elusive V rank on every mission on the highest difficulty. To you, brave souls, I salute you. Me? I’ll just stick to Medium and Hard, thank you very much. I love that there are these options though, a wide range of difficulty settings is never a bad thing. While most games these days offer this type of broad range, it’s still worth commending. More players means more games, and I’m cool with that. If you’ve read my past reviews, you know I’m a bit on the easily embarrassed side where fanservice is concerned. Fortunately, as a trend, it seems more of these games are allowing increasing amounts of customization. Onechanbara Z2: Chaos seems to understand people like me and, like other games of its ilk, offers an impressively robust character customization screen. For completionists, customization mode alone is enough to justify spending a lot of time with Z2. There are tons of options to unlock, and to do so you’ll have to mostly complete challenge the game sets forth for you, many of which will require playthroughs. Onechanbara Z2 allows you to change just about everything about your character, short of their facial features. You can swap out hairstyles, outfits, and add stuff like various accessories or horns. For someone a bit more prudish like me, the ability to put Kagura and Aya in something a little less revealing is welcome. Let me start with the obvious, Onechanbara is not a character-driven series. The girls don’t really develop in any meaningful sense, nor do they really evoke any serious emotion from the player. That’s fine, though, really! Like I said before, this isn’t that kind of game. And really, not every game should strive to be that. Of the four characters, Saki, the rightmost girl in the image above, was far and away my favorite. Saki is the brawler of the group, using knuckles as her main weapon. You’d expect her to be more brash and rude, based on stereotypical brawlers in Japanese media, but Saki seems to be more reserved. The same is true for most of the other characters, as well. The banter between the characters is often fun, and their distinct fighting styles lend to each of them feeling fresh. Switching back and forth between each character is a breeze, and their weapons make a world of difference. I’m a particularly huge fan of Saki’s knuckles, Kagura’s dual blades and Saaya’s chainsaw. No one character feels like they’re any less fun than the others, which is a feat. Switching from Saki to Aya to Saaya to Kagura and back mid-battle feels fun and is fluid, though it can be a little disorienting if you do so while all four are on screen fighting. If you go in without any preconceived ideas as to who you’ll like best, you’ll find something to enjoy with each of them. As Kotaku’s Richard Eisenbeis mentioned in his preview of Onechanbara Z2 last year, the series started out as a budget title. Sadly, that shows a bit in the game’s graphics. 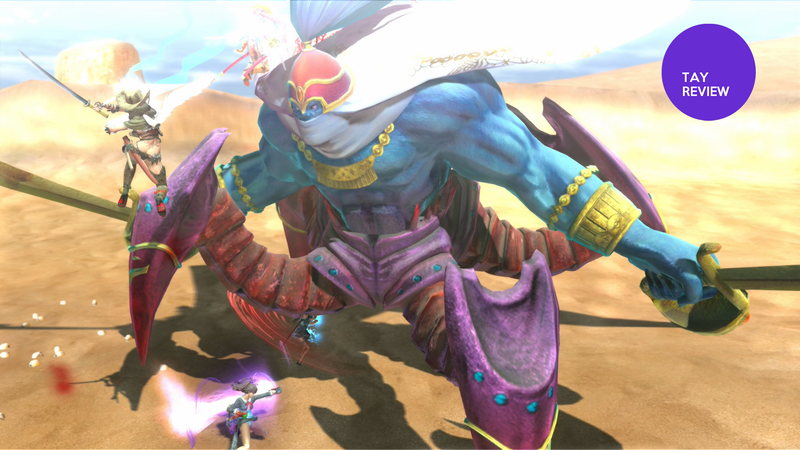 Environments seem somewhat bland, with weak texture work, and some of the larger boss enemies can look particularly bad. It’s nothing too distracting, but as a PS4 exclusive and the first current-gen only Onechanbara title I have to admit I was hoping for a bit more visual polish. The character models look passably good, but they almost look out of place compared to the dull environments and the smaller bosses. It’s not enough to put me off, but I’m hoping Z2’s inevitable sequel is a bit more of a looker. Invisible walls might just be the most annoying thing in modern gaming. Unfortunately, Onechanbara—the whole series, not just this game, either—is full of them. They don’t get in the way often, but when they do, it’s incredibly annoying. Sure, there are parts where you think you should be able to reach a door and can’t; that’s not really a big deal. However, there are times where zombies are on catwalks or platforms, and without a proper double jump, you’re left facing an incredibly difficult time chasing these zombies or running up flights of stairs to get back to them, only to have them fall off a ledge, so you can jump down with no real way to get back. Sadly, there’s no consideration for verticality present, and really there isn’t much use for it, but in the few later stages of the game where zombies are on multiple levels, it quickly saps enjoyment from the game. Games can be art. Onechanbara Z2: Chaos fails at being art. Game can be entertainment. Z2 succeeds spectacularly at being entertainment. It’s a fun, wacky game urges you to to hop in and have fun. And if there’s anything recent events have reminded me of in regard to video games in general, it’s that we all need to make room to have fun in our lives. Onechanbara proves that being fun really can be enough. To contact the author of this post, find him on Twitter at @SteveBTAY. To read more of his articles, click here.